Searching and researching a title for a travel blog is tough work. My original idea was “Old Hippies Hit the Road”, my daughter christened us old hippies, but it doesn’t really fit. Then came “Bluenoser Travel” until I looked up the definition of Bluenoser (which is defined as a puritanical person-I always thought it meant from Nova Scotia!). Other titles I tried included: Frugal Traveller (taken), Inspired Wanderer (taken), Exhilarated Excursions (not really descriptive of my travel style). After several days, I opted for The Inspired Packer. Whether you are travelling for a few days in your own province or thousands of miles away, packing signals the start of your journey. This site is about travel. Something I am passionate about. If you are under 30 and your travel style involves hiking for days in the wilderness and pitching a tent where-ever you fetch up, this site probably isn’t for you. I’m not into that much adventure. If you are over 30 and your travel style involves staying at 5 star hotels, using taxis and local guides, this site may not hold many answers for you. 5 star hotels can be nice, but I usually don’t have that much money to spend. But, if your are moderately active, seek low-cost travel experiences and are not afraid to climb aboard local transport and discover a place on your own, you may find answers here. 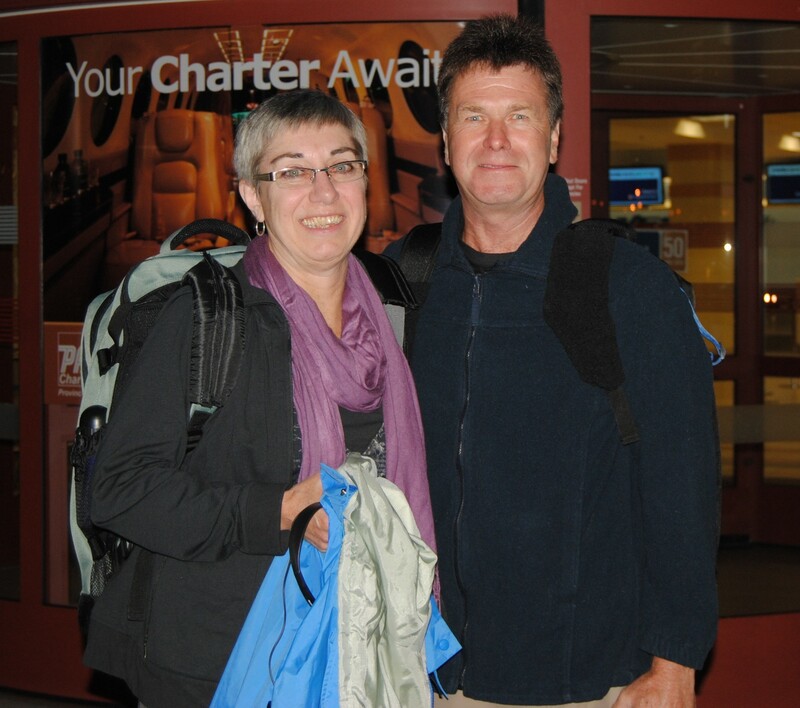 Picture: Here we are at the Halifax airport ready to hit the road for 6 weeks.